This dial controls temperature. Turn it clockwise for hot and anticlockwise for cold. The amount of airfl ow will be automatically controlled in accordance with the set temperature. The airfl ow amount can be adjusted to the desired level by turning the dial. To turn off the system, set the dial to 0 position. The airfl ow mode automatically adjusts to the selected temperature. The desired airfl ow position can be selected by turning the dial. 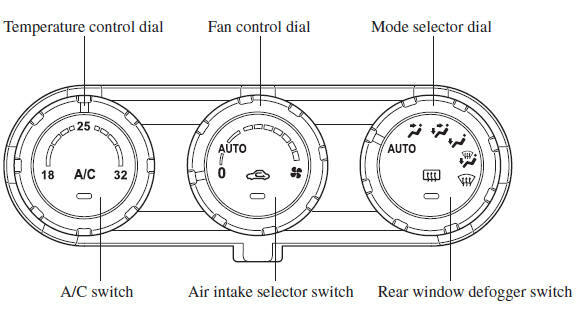 position and the temperature control dial set at a medium temperature, heated air is directed to the feet and air at a comparably lower temperature will fl ow through the central, left and right vents. 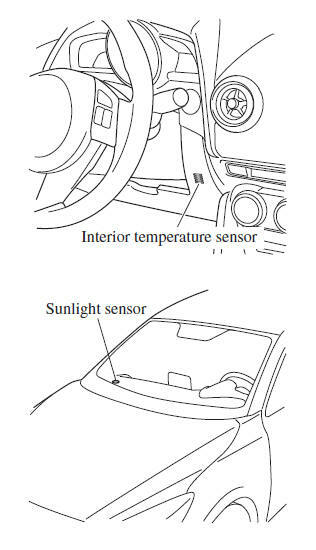 position, the air conditioner is automatically turned on and the outside air mode is automatically selected to defrost the windscreen. The air conditioning (cooling/ dehumidifying functions) can be turned on or off by pressing the switch while the fan control dial is at a position other than 0. The indicator light turns on while the air conditioning is operating. Outside air is shut off. Use this position when going through tunnels, driving in congested traffi c (high engine exhaust areas) or when quick cooling is desired. Set the mode selector dial to the AUTO position. Set the air intake selector to the outside air position (indicator light turned off). If the recirculated air position is used for long periods in cold weather or high humidity, the windscreen may fog up more easily. Set the fan control dial to the AUTO position. Press the A/C switch to operate the air conditioning (turn indicator light on). To turn off the system, set the fan control dial to the 0 position. Setting the temperature to maximum high or low will not provide the desired temperature at a faster rate. When selecting heat, the system will restrict airfl ow until it has warmed to prevent cold air from blowing out of the vents. (European model) For an optimal cabin temperature, set the temperature close to “22.0”. Adjust to the desired temperature if necessary. (Except European model) For an optimal cabin temperature, set the temperature close to “25.0”. In this position, the outside air position is automatically selected, and when the fan control dial is ON, the air conditioner automatically turns on. 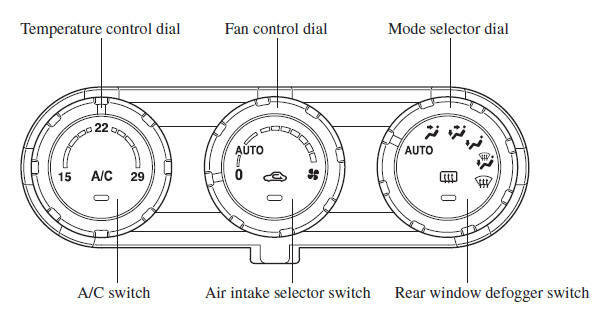 The air conditioner will directly dehumidify the air to the front windscreen and side windows (page 5-4 ). Airfl ow amount will be increased. temperature control set to the cold position is dangerous as it will cause the outside of the windscreen to fog up. The air-conditioning system measures inside and outside temperatures, and sunlight. It then sets temperatures inside the passenger compartment accordingly. Do not obstruct either sensor, otherwise the air-conditioning system will not operate properly.